Get a $150 bonus when you open a new Chase SavingsSM account, deposit a total of $10,000 or more in new money within 20 business days & maintain a $10,000 balance for 90 days. This offer is only available to new Chase customers, or those who have not had a Chase account in the past 90 days. Explore the benefits of opening a Chase Savings account today! You can apply for your new account online now! 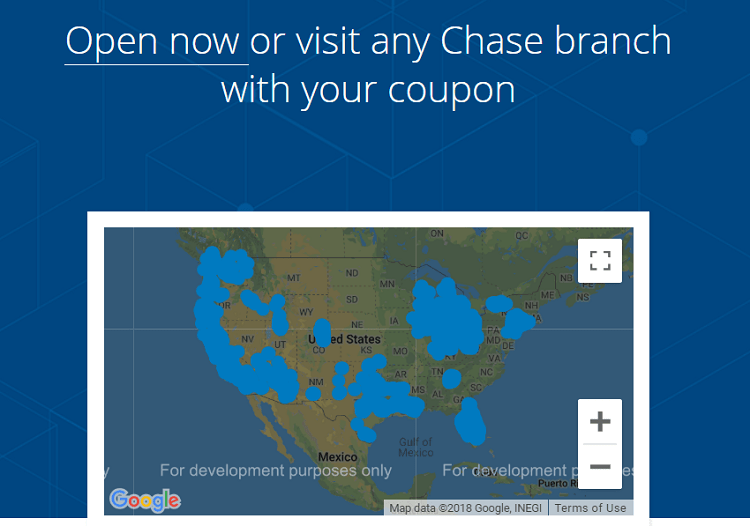 Or, if you live near a Chase branch, you can request a coupon online then take it in-branch to open your new account. Also, don’t forget to check out our extensive list of Chase Bank Bonuses to see what other bonuses Chase Bank has to offer and read what our readers experienced in the comment section! • Link this account to your Chase checking account for Overdraft Protection. • Apply online in minutes. Open your account online now. Early Termination Fee: Must have the account open for more than 6 months or bonus will be taken away. Open a new Chase SavingsSM account online or enter your email to receive a coupon, then visit a physical Chase branch to open your account, subject to approval. Deposit a total of $10,000 or more in new money within 20 business days. Maintain a $10,000 balance for 90 days. After you have completed all the above savings requirements, your bonus will be deposited in your new account within 10 business days. Don’t forget to open a Chase SavingsSM account today and the $150 bonus can be yours when you meet the requirements. I recommend you to have both checking and a Chase SavingsSM, as this will allow you to transfer funds more quickly than keeping them at two separate banks. Also, the fee waivers on these accounts involve linking or transferring funds from a Chase checking account, which means you won’t pay any monthly fees on the savings account. Make sure to avoid losing your bonus by keeping your account open for more than 6 months. Also, this savings bonus offer can only be done once a year. Sign up today! Be sure to see our complete list of Bank Bonuses! Please forward the $100 coupon to me for the savings account. Please forward the savings account coupon to me. Please forward the saving account coupon to me. Please forward the $150 Promo Code Coupon to me for a new savings account asap.Thank You!